Last year I did T25 Alpha and Beta – and for Christmas I got T25 Gamma – and basically never really stopped doing it about 3 times a week or so, because I really enjoy it. Then I left my job and having a bit of time in my hands I decided to try and complete the infamous ‘Insanity‘ workout. This would also be a good way to get me out of bed in the morning. I had completed the first four weeks and the recovery week with a little change to my weight/measurements by the beginning of May – however the fit test indicated I had made good progress fitness wise, which was the main intention. Except for power jumps… From around week three I started to get this pain, which at first I thought was left hip pain – but upon further investigation, and observation of the pain, seems to be in the Vastus Intermedius and Vastus Lateralis (when I press on it I can feel it radiating very faintly onto my left knee). A couple of years ago I had what I thought was a ‘knee injury‘ on the same side, which I fixed by massaging the thigh with a roller and a ball, and I think it’s the same set of muscles again. So I started rolling on it and massaging. It hurt like hell!!!! Maybe I was just getting too old to be doing those jumps, but by the second phase of Insanity, where the workouts go from around 40 minutes long to 50 to 60 minutes, it no longer bothered me. 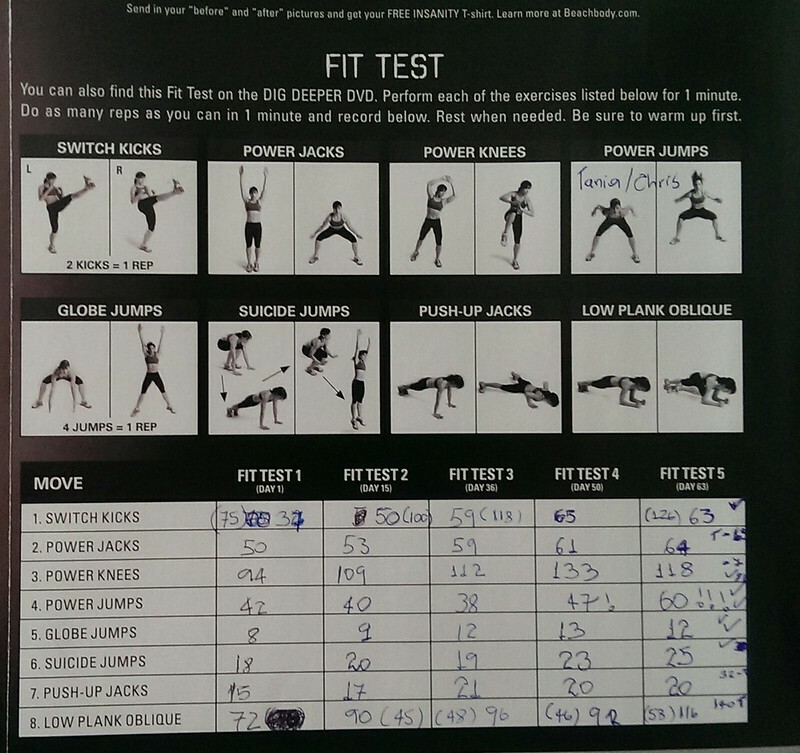 Second phase: After taking the fitness test I went on to the Max Interval Circuit workout. I decided I’d get through this without energy drinks of any sort, so after an apple, drinking yoghurt and a coffee (which really is an energy drink, I normally have a coffee AFTER Insanity) I started the workout and I might have to revise the energy drink thing as I had nothing left about 20 mins before the end. I take Zero High on Friday Capoeira, as it’s longer than 1.5 hours so I might have a half tab of that. It was the longest hour! At the end of the workout Saun tells us to come back down to reality, and it really did feel like I had been on some parallel universe. This workout was so intense the people doing it on the DVD struggled too :D. Also, where is Tania???? She’s back for the other workouts though. You are asked to take before-after photos on days 1, 30 and 60 if you want to get the Insanity t-shirt – but really there is no change that you can see in the photos from days 1 and 30, like you could so clearly see when I did T25. However my legs do feel stronger and look more toned to the naked eye, but that isn’t coming out on the photos. My main goal was to increase fitness for Capoeira and running. I had very little muscle soreness (same with T25) – obviously down to already being fit – but also I think due to good warmups/cool down and drinking a lot of water. Apart, of course, from minor injury mentioned above. 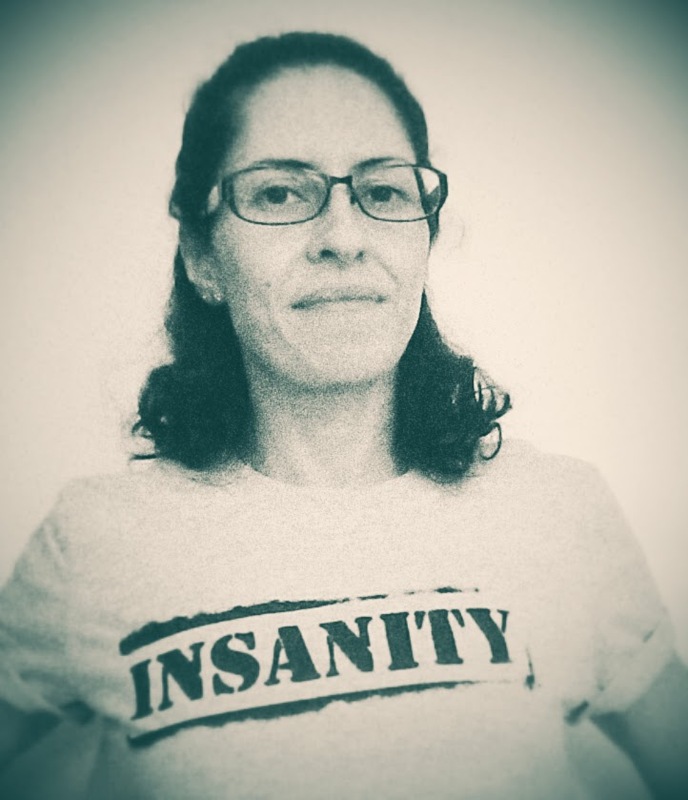 And here an in-depth review of Insanity (and various other DVD workouts) by a very dedicated woman, Bettany Busche, dumbells and diapers. Excellent work, I read it before buying Insanity. More importantly, I felt a lot fitter, and my average running time had improved. 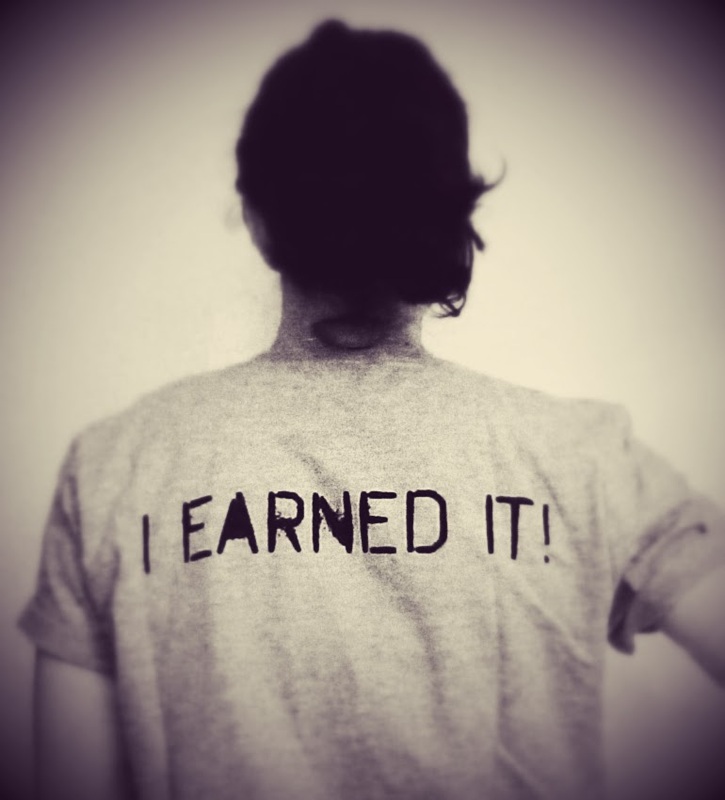 Stamina for Capoeira was also up, and people commented that I looked stronger.